Welcome to the Fly Away Simulation flight sim news section - the homepage to where you can find the latest news from the newsdesk at Fly Away Simulation. Below is a selection of the categories we cover, the latest 3 articles from each section are included but if you would like to read more on each topic, click the "View more posts..." link. A selection of categories have now been archived because the news is either very old and there is no current news for the topic or the category is now obsolete. You can still view them at the foot of the page here. We feature news, reviews, and editorials for many of the major simulators such as FSW, FSX, FS2004 and of course X-Plane. Our news is always unique, insightful and usually, opinion based. We try to feature rich media where we can such as screenshots, images, and videos. - You can also follow the latest news topics on Apple News, just click here using your iOS device. - You can subscribe, syndicate or use our RSS feed here - it features 20 of the latest articles from all sections. The most advanced and highly detailed flight simulator for the PC; Microsoft Flight Simulator X. Flight Simulator X or as it's know in the community FSX is the latest flight simulator developer by Microsoft and is currently the last flight simulator being produced by Microsoft and the ACES studio. The ACES team were cut from Microsoft's budget leaving no development team to work on the next flight simulator release. It's possible that Microsoft will sell the Flight Simulator franchise to an external company for them to develop a new release, however nothing has been confirmed. This topic features news related to the latest add-ons, software and downloads for FSX. X-Plane is one of the most advanced and sophisticated flight simulator packages available. They have released versions for PC, Mac and Linux and now even iPhone. X-Plane provides the end user with a sophisticated flight environment with ultra realistic flight dynamics. While X-Plane isn't the most popular flight simulator, it is growing its user base because of the demise of Microsoft Flight Simulator. X-Plane is destined to become the next biggest flight simulator package for a mix of platforms. News and updates regarding the latest release from Dovetail Games called, "Flight Sim World" or as it has become know, FSW. Here you can find the latest news, reviews and releases covered for FSW. Stay tuned for further updates as this next generation flight simulator has only just been announced. Flight Simulator 2004 was the flight simulator that changed it all for Microsoft. This product was the best selling flight simulator on the market and produced record sales. With many advanced features and improvements in the weather engine and graphics; aircraft and downloads being produced by freeware developers, this was one of the most customizable flight simulators for Windows. Some fans still think that this is a better simulator than later releases by Microsoft. While slowing down, FS2004 is still a very active topic. Reviews of flight simulator software and add-ons from the review team here at Fly Away. 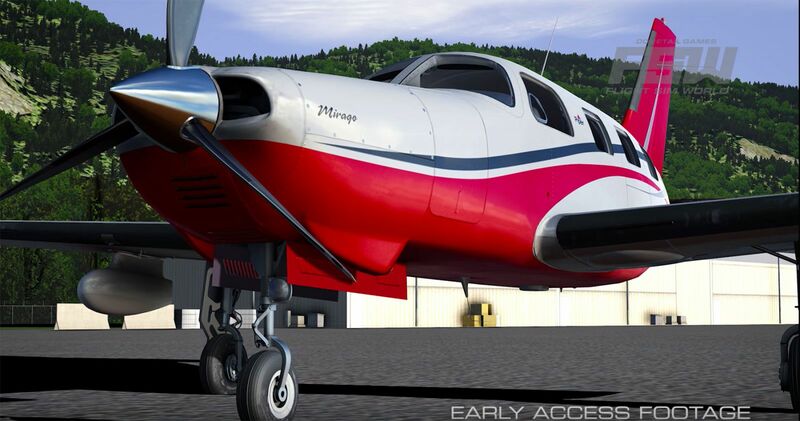 We review many payware aircraft, scenery and enhancement products. Reviews are highly detailed with honest opinions and high quality screenshots. Some of our reviews include 737 Pilot in Command, PMDG 747, PMDG MD-11 and many more. This topic covers all the latest payware add-on releases for all of the flight simulators featured on this website. The payware releases are delivered from our on-line flight sim store SimShack.net. SimShack.net are stockists of hundreds of payware flight sim add-ons for purchase. They deliver physical media (CD versions) and have now started stocking digital downloads for immediate delivery to your desktop with no wait. There are many payware add-ons for FSX, FS2004 and X-Plane. Flight simulator news that does not belong to a specific topic can be found here, or news that spans multiple topics. For example, an add-on for FSX and FS2004 will be included in this category. This topic also features other flight sim related news such as community updates, competitions and payware developer press releases. OK, we all like freebies, free stuff, and offers. However, sometimes even the thriftiest of us have to accept that on occasion you “get what you pay for!” While the virtual world of aviation offers some amazingly high-quality freeware add-ons, some of the payware available simply serves to open up your virtual flying experience. Indeed, they bring some of the most famous, picturesque parts of the world right into your living room via your computer screen, as well as offering some of the most graceful aerial machines to ever take to the skies to visit them in. As one of the most commonly used Aerosoft releases, the Airbus Professional package has undergone a major reboot and revival. This latest take on the Airbus range covers the A318/319, A320/321 and A330 Professional models previously released. Having been promised to see updates since release, the latest changes to iFMS 2 have arrived. In the 2.1 update, some minor changes were made to help further tweak and improve how the add-on works. According to a Press Release issued in March 2010, Virtual Aviation's new Virtual Type Rating enables you to train like a professional pilot in either their Boeing 737 or Airbus A320 simulator. This makes new Virtual Type Rating the closest thing to becoming an airline pilot. Joining a virtual airline is a great way to add another element of fun to your flight simulator experience. When you join a virtual airline you can build up your virtual flying hours for an actual virtual airline company who will provide you with flights, routes and flight plans to follow. They usually have a roster to show who has accumulated the most flying hours. Joining a virtual airline will open up your flight simulation world. You can also get payware aircraft from VAs at lower prices than standard retail shops. Our editorial section is one of our most interesting. Editors write about their opinions regarding flight simulators and add-ons, however we have several writers who write about real-life aviation and their flying experiences. Most of the editorials are opinion based, you should read them through and make your own mind up about the content. From time to time we feature news related to train simulation. This is a flight simulator website that focuses heavily on simulated flight, however many of our users are train sim enthusiasts too. One of the popular train simulator packages we cover is Microsoft Train Simulator (which has now been discontinued), Trainz and RailWorks. Included are press releases, industry updates and payware product releases. Aviation news from the editors at Fly Away Simulation. Featuring the latest aviation and aerospace updates and press releases. We feature content about the latest airplane news and any topics related to real world aircraft, not flight simulation. International airports and general airport news are also included here. Below are the categories that have been archived because they are for older or obsolete simulators or don't fit into the sections above.